Food Costs > How Much Does a Kiwi Fruit Cost? How Much Does a Kiwi Fruit Cost? The kiwifruit, also referred to as a Chinese gooseberry, is the edible berry of a woody vine in the genus Actinidia. Shaped as an oval, it is about two inches in diameter and has a dull greenish-brown skin. Inside is a bright green flesh with rows of tiny edible seeds. This fruit is known to be cropped in Chile, Greece, France and Italy. The cost of kiwi will depend on the time of year, amount purchased, geographical location and where you’re purchasing it. On average, a kiwi at a local grocery store or farmers’ market can cost $0.25 to $0.75 per fruit. It is not uncommon for grocery stores to have them on sale for four for a $1. Larger purchases at wholesale clubs, such as Costco, can cost close to $8 for four pounds. Sam’s Club, on the other hand, charges close to $5 per three pounds. According to a USDA report in 2015, the average retail price per pound is $2.04. Kiwi can also often come as a dried fruit snack. As a dried fruit, plan on spending anywhere from $2 to $5 per pound. For example, a five-pound case of dried kiwi can cost $19 to $25. The skin, even though most peel it, is actually edible and is known to be full of nutrients and lots of fiber. Most people will discard it due to the texture. The average kiwi will be two inches in diameter and will contain close to two grams of fiber. It’s also packed with potassium and vitamins C and E. It has no fat, sodium or cholesterol. Kiwi can be eaten on its own, mixed with juice, baked or prepared as a side garnish for an entree. Kiwis can be used as a garnish to add your favorite drink or even as a great addition to any fruit salad. You can also preserve kiwis to exponentially increases its flavor. After cutting, be sure to eat immediately since a kiwi has a special enzyme that’s known to have tenderizing effects. These effects can soften the kiwi as it sits. When you choose a kiwi, look for unwrinkled and unblemished skins. A good kiwi will have a rough and fuzzy feel to it. If it doesn’t yield any pressure when you touch it, then it’s best to allow it to ripen at room temperature away from the sun. A kiwi will ripen quicker if you place it in a paper bag with either an apple or banana. Store them at room temperature away from other fruits since they will ripen quickly. Healthline.com says a kiwi fruit can offer many benefits, including treating asthma, aiding digestion, boosting the immune system, managing blood pressure, reducing blood clotting and protecting against vision loss. 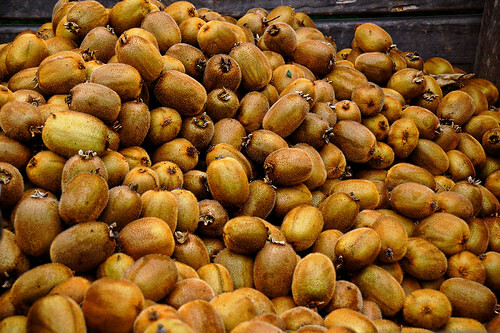 Not all kiwis will be fuzzy as there are some varieties such as the golden and smooth bronze kiwi has non-fuzzy surface. Buying in bulk is often the easiest way to save money. As stated above, your warehouse stores, such as Costco and Sam’s Club, will often have the cheapest prices.